The cystatin C test checks the cystatin C blood level. What is the cystatin C test? The cystatin C test measures the cystatin C blood level. Why is the cystatin C test important? The cystatin C test is a sensitive test for evaluating how well the kidney is functioning. This Cystatin C Test is a blood test. The cystatin C test, also known as a cystatin C level test, measures the cystatin C blood level. Cystatin C is a protein that helps assess kidney function. Cystatin C is a highly accurate way of assessing how well the kidneys are performing their function as filters for the body. While the creatinine test has traditionally been used in medicine as a core marker for measuring kidney function, the creatinine level can be subject to inaccuracies in certain situations. For example, creatinine blood levels are not highly sensitive and can be influenced by the amount of muscle mass in the body. Some people also consider the renal function panel test when they are interested in evaluating their kidney health in the context of other electrolytes. The cystatin C blood level, like the creatinine level, rises as the rate of filtration by the kidney (i.e. the glomerular filtration rate). It appears to be more sensitive in detecting early kidney disease in most people. Newer research is looking into how cystatin C test results correlate with cardiovascular risk as well as cancer but the conclusiveness of any associations are still unclear. To get a cystatin C test near you, just order online and get your blood drawn at the Quest Diagnostics lab. Once your cystatin C lab report is ready, it will be available for download. 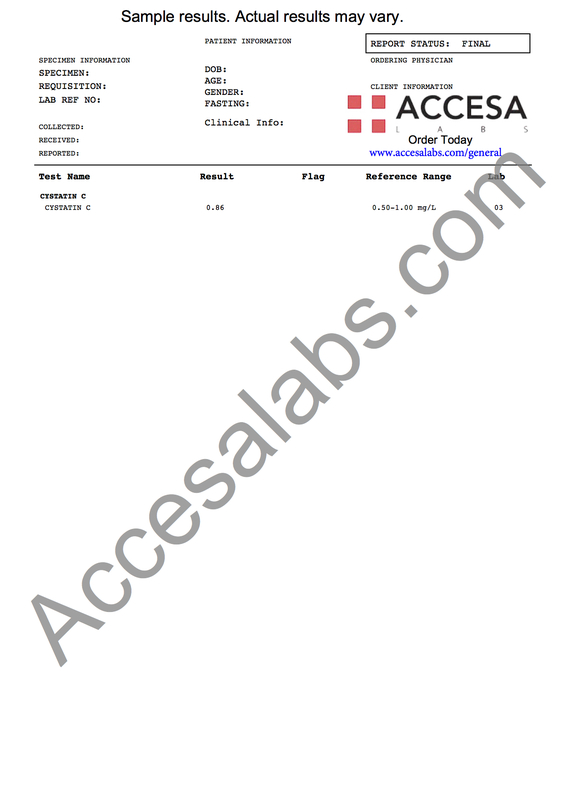 As can be seen on the sample cystatin C lab results above, the cystatin C blood level is reported as a number which can be compared against the reference range provided by the lab. Cystatin C Test at Guaranteed Prices.